Because they’re on the main trail, two of Deep Creek’s waterfalls — the Tom Branch and Indian Creek falls — are relatively easy to visit. But Juneywhank Falls requires a little more effort. And those that make the short quarter-mile uphill trek to the falls are rewarded with a beautiful 80-foot cascade. And if a brief rest is desired, there’s a wide foot bridge at the foot of the falls, with benches for sitting and viewing the show. 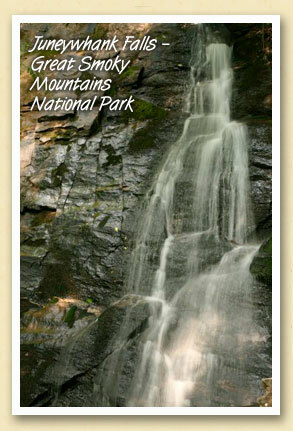 Download a map of the Deep Creek trails and waterfalls. More info.